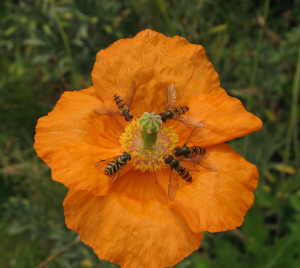 These orange poppy flowers were covered with hoverflies this morning, mostly the Marmalade Hoverfly (possibly an influx of migrant individuals), but a few others as well. The first photo shows three male and one female Marmalade Hoverflies, plus a female Dasysyrphus albostriatus. The second photo has more Marmalade Hoverflies, with another species flying in (possibly Eupoedes luniger).